Featuring sporty equestrian styling and silky soft, light weight outer fabric that sheds dirt and hair-- this vest is great in and out of the barn. Equipped with an exposed two-way front zipper, and double back vent. 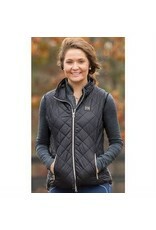 STYLISH: Sporty equestrian styling, back vents, and tying self-belt give a form flattering look. Beautiful black and gray plaid lining.